At the start of World War, II the U.S. Army turned to Americans of Japanese ancestry to provide vital intelligence against Japanese forces in the Pacific. 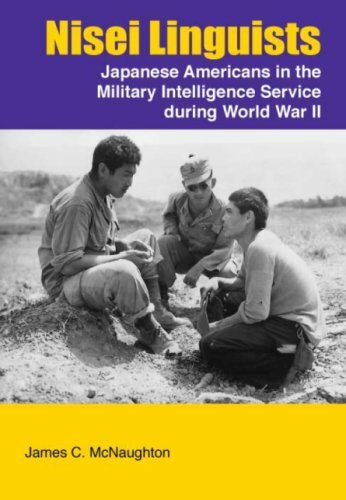 Nisei Linguists: Japanese Americans in the Military Intelligence Service during World War II tells the story of these soldiers, how the Military Intelligence Service (MIS) recruited and trained them, and how they served in every battle and campaign in the war against Japan. Months before Pearl Harbor, the Western Defense Command (WDC) selected sixty Nisei soldiers for Japanese-language training. When the WDC forcibly removed more than 100,000 persons of Japanese ancestry from the West Coast, MIS continued to recruit Nisei from the relocation camps and later from Hawaii. Over the next four years, the school graduated nearly 6,000 military linguists, including dozens of Nisei women and hundreds of Caucasians. Nisei Linguists tells the remarkable story of those who served with Army and Marine units from Guadalcanal to the Philippines, Iwo Jima, and Okinawa. Their duties included translation, interrogation, radio monitoring, and psychological warfare. They staffed theater-level intelligence centers such as the Allied Translator and Interpreter Section in the Southwest Pacific Area. In China, Burma, and India they served with the Office of Strategic Services, Merrill’s Marauders, and Commonwealth forces. Others served with the Army Air Forces or within the continental United States. At war’s end, the Nisei facilitated local surrenders of Japanese forces as well as the occupation. Working in military government, war crimes trials, censorship, and counterintelligence, the MIS Nisei contributed to the occupation’s ultimate success. James C. McNaughton is command historian for U.S. European Command in Stuttgart, Germany. He previously served as command historian for U.S. Army Pacific and the Defense Language Institute. He received a doctorate in modern European history from The Johns Hopkins University and is retired from the U.S. Army Reserve with the rank of lieutenant colonel.